You've bought this product 11 times. You've bought from this vendor 13 times. Q: Have you thought of switching to glass bottles? Q: Hi, do you ever sell raw milk for pets? Q: Do you sell 16 oz? Q: Do u have skin millk? Q: Do you have 1/2 & 1/2 or heavy cream and butter. All products I use and would buy from your company. Q: Do you sell cream. I see in the picture a small bottle and wondered. Q: When will you expect your next order of chocolate mix in? Q: Do you sell butter? Q: Will you have chocolate milk available again? Q: Are the cows grass fed? Q: Is cream available for purchase? Q: It may be a silly question but what exactly is pasteurized and what is homogenized mean? A: Pasturizing kills harmful bacteria extending the quality and freshness of the milk. Homogenize means the cream is is mixed with the milk in such a way that it will not separate into its natural form. Q: Can I make cheese from this milk? Q: Jersey cows. My favorite. Wow. Q: Is your milk organic? Q: Is your milk organic? And are the cows grass fed? Q: How long does the milk stay fresh? If I were to buy some today what would the “use by” or expiration date be? 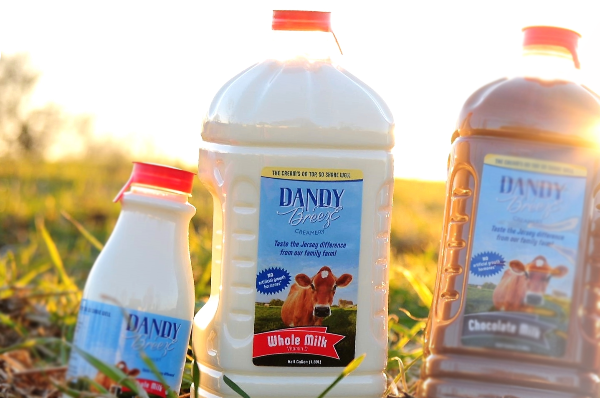 Q: Is your milk bottled in glass or plastic? Q: is your milk suitable for making cheese? i know I can't use ultra high pasteurized milk. Q: Is this A-1 β-casein or A-2 Milk? Q: is this the only size you sell? Q: Is the cows raised organic and no hormones? Q: How long is the milk usually good for? I got a half gallon in this week's order and the best by date is difficult to read. Q: Can I buy directly from your farm, or do I have to order online? A: We are not set up to do retail sales. Q: Do you sell 1% or skim milk? Q: Can u explain pasteurized and homogenized? What's does it mean. A: Pasteurizing is a heat-treating process that kills any bacteria that may be living in the milk when it's expressed from the cow. This process is required by the FDA. However, we use a gentler method on our farm to preserve as much of the original enzymes as possible. Homogenizing is the process of vigorously shaking the milk (think of a paint can shaker) so that the fat is suspended with the milk in such a way that the two will not separate. This is not required by law, but large milk producers began doing it in order to extend the shelf-life of their product as it travels hundreds of miles to your supermarket. We do not homogenize, so you can pour off the cream from the top of our milk after you buy it and use it separately, or shake well for whole milk. Q: Are your cows grass fed or grain fed? A: The cows mainly eat grass, hay, and some silage. They are occasionally fed non-GMO grain. July 22nd, 2017 person_outline Laura H.